When it came time to search for colleges, Alyssa Stetson had two requirements; It had to be in Vermont and it had to have a great social work program. When Stetson visited Castleton, she knew that it was the perfect fit for her. “I knew that I didn’t want to be in a classroom full of 100 students, so a small campus with a low 1:1 ratio was a must,” she said. Stetson was initially attracted to the field of social work after learning more about a friend’s experience in foster care. “I met my friend in high school and quickly learned how foster care affected his life, and not in a positive way,” she said. 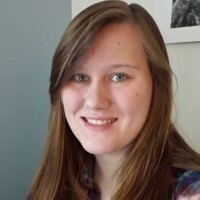 Stetson began her college experience at nearby Community College of Vermont, and it was there that she met a professor who solidified her career aspirations. “She would always talk about her clients and the cases she was working on, and I fell in love with her stories and knew this is what I wanted to do the rest of my life,” she said. Stetson credits the support she received from professors such as Dr. Luther Brown with being able to take full advantage of opportunities to learn both in and out of the classroom. While at Castleton, Stetson became a certified PAC (Peer Advocate for CHANGE) member, completing training on how to educate the campus community about sexual assault, dating violence, stalking, and more. According to Stetson, the greatest opportunity for hands-on learning came from the social work program requirement that every senior complete a 400-hour internship. This experience prepared her for work in a professional setting.